Disney Publishing Worldwide (DPW) and Walt Disney Records announced today the launch of "Disney Karaoke: Frozen," an app based on the highest grossing animated film of all time, Frozen. "Disney Karaoke: Frozen" will be available in the Music and Entertainment categories of the App Store? with movie clips and nine original songs from the film that are featured in the triple Platinum-selling soundtrack from Walt Disney Records. 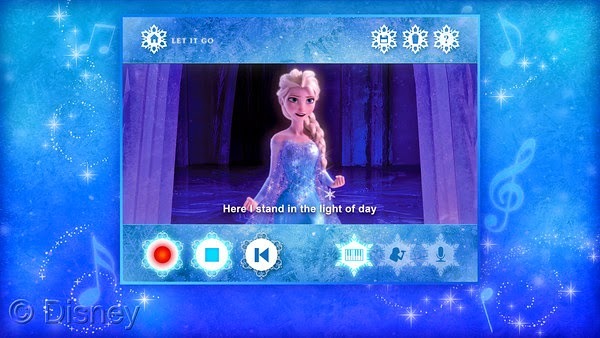 The "Disney Karaoke: Frozen" app allows consumers to listen, sing along, and record their own voice through an assortment of nine songs from the film, including "Do You Want to Build a Snowman?," "For the First Time in Forever," "Love is An Open Door," the Academy Award-winning hit, "Let It Go," and more. To further enrich the consumer experience, the app allows fans to follow the lyrics with a snowflake and save recordings to a gallery. It can also be used with AirPlay®, offering singers the opportunity to play the music on television screens in their living room. "Disney Karaoke: Frozen" is the next installment in a growing collection of digital apps by DPW that invites fans of all ages to re-live the stunning big-screen comedy adventure featuring fearless optimist, Anna, and her sister, Elsa. "Frozen Storybook Deluxe," was the first to launch in the collection and has since hit the Top 10 iPad Kids Category for downloads in 114 different countries and a Top 10 iPad Entertainment Category for downloads in 118 different countries. Later this year, additional Frozen apps will be unveiled to extend engagement of the franchise through unique and immersive digital storytelling. "As we continue to extend Disney franchises across digital platforms, there is nothing more exciting than exploring the ways in which we can reach today's consumers in deeper, more engaging ways with our incredible stories and characters," said Lyle Underkoffler, vice president, Digital Media. "The 'Disney Karaoke: Frozen' app celebrates the beautiful music that everyone knows and loves, but it also allows fans to experience the movie anytime and anywhere in a highly active and uniquely Disney way." "Disney Music Group has had a long history of success with karaoke products, and it's incredibly exciting to see this part of our business continue to innovate and grow," added Trevor Kelley, vice president, Global Digital Marketing. "Frozen really is the perfect title to launch this product with given the strong personal connection that fans have had with the music from the film. It's been incredible to get it into consumers' hands." A leader in the karaoke audio category, Walt Disney Records also has 30+ titles in the Disney Karaoke Series with over 1.5mm in sales since the line's inception in 2005. Frozen is the only Disney Karaoke title to debut in the Top 20 on the Billboard Top 200 chart at #17. The Frozen original motion picture soundtrack spent thirteen non-consecutive weeks at No. 1 on The Billboard 200 album chart and remains the top-selling album of 2014. The Frozen soundtrack surpassed The Lion King's 10-week reign at No. 1 in 1994 and has spent the most weeks at No. 1 for an animated film soundtrack in the 58-year history of the chart. Disney Consumer Products is also celebrating the music from Frozen with new products that will be available at mass retailers and Disney Store this fall featuring the beloved songs from the film. From dolls, to role-play dresses, to jewelry sets and more, Frozen fans will be able to recreate the musical moments of their favorite characters. For additional "Disney Karaoke: Frozen" mobile app updates and information, visit www.DisneyStories.com, Facebook at Facebook.com/disneyreads and Twitter at @DisneyReads. Disney Publishing Worldwide (DPW) is the world's largest publisher of children's books, magazines, and apps, with over 500 million products sold each year. DPW consists of an extensive worldwide books and magazines licensing structure as well as vertically integrated publishing imprints, including Disney-Hyperion and Disney Press in the U.S. and Disney Libri in Italy. DPW's digital products include bestselling eBook titles and award-winning original apps. Disney English is DPW's English language learning business, which includes learning centers in China and a worldwide retail-licensing program. Headquartered in Glendale, California, DPW publishes books, magazines, comics, and digital products in 153 countries in 75 languages. For more information visit www.disneypublishing.com. Disney Music Group is home to Hollywood Records, Walt Disney Records, Disney Music Publishing, and DMG Nashville. The labels' genre-spanning rosters include Selena Gomez, Demi Lovato, Grace Potter & The Nocturnals, Lucy Hale, Zendaya, R5, Bridgit Mendler, Bea Miller, Sabrina Carpenter, Plain White T's, Redlight King, ZZ Ward, and more. DMG also releases family music and film and television soundtracks such as the Grammy-nominated soundtracks for The Muppets and Brave, Monsters University, Iron Man 3: Heroes Fall, Teen Beach Movie, Shake It Up, and the Billboard chart-topping original motion picture soundtrack for Frozen. iPad, App Store and AirPlay are trademarks of Apple Inc.